What If 'Everyone" Smells a Top Here? It’s tempting to think last week’s high at 2866.00 (click on inset) will mark the final gasp of an exceptionally powerful bear rally. 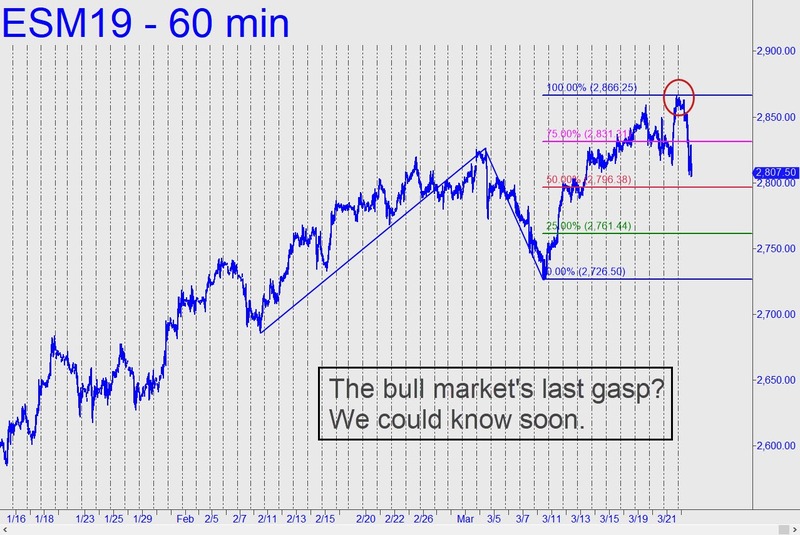 If so, it will have occurred in a place where we might have expected Mr. Market to spring a nasty trap on bulls and bears alike. The latter would have thrown in the towel and covered short positions when the S&Ps broke out over the last two weeks above three descending peaks recorded last autumn. As for bulls, they are probably still drooling at the prospect of new all-time highs, since the 2866 peak that preceded Friday’s selloff came within 3% of that threshold. Both could be proven wrong, although it might take a few more weeks before we know for sure. Friday’s cascade on Wall Street felt particularly scary because it came amidst an onslaught of downbeat news concerning the dramatic slowdown in the global economy. Growth in Europe and China seems ready to plummet and take the U.S. economy with it. There was also an unsettling development in the financial sector as borrowing rates on 90-day T-bills exceeded those on the Ten-Year Note. The last time the yield curve inverted was in 2007, just before the financial system and stock market crashed. A rate inversion has preceded every recession since 1975. A further concern was that yields on German bonds swung negative, begging the question of whether it’s too late in the game for so urgent and desperate an attempt at stimulus to work. In the meantime, I have outstanding rally targets at 2924.50 and 3005.63 for this vehicle, which settled on Friday at 2807, down 55 points. Although it’s possible that last Thursday’s top at the 2866 target was the start of The Big One, a glance at the chart reveals that the day’s heavy losses were small when viewed against the steep, relentless rally begun in the final days of 2018. We will treat last week’s top with respect and caution in any event, but we should remain alert to the possibility of one more upthrust that would set up bulls and bears for the haymaker.